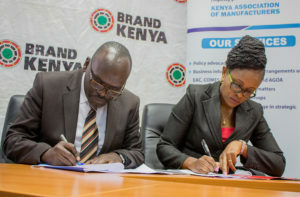 The Kenya Association of Manufacturers (KAM) has today inked a partnership deal with Brand Kenya Board to hasten the uptake and implementation of the Made in Kenya Brand Mark that was launched recently by Deputy President William Ruto. The Mark, which was developed by Brand Kenya and key partners, is a unique identifier for Kenyan made products on local and global markets and is expected to boost the Buy Kenya, Build Kenya initiative by promoting consumer base for local manufacturers. The partnership seeks to promote the Made in Kenya Brand Mark to manufacturers and collection of feedback about the Made in Kenya Initiative. Speaking during the signing ceremony, KAM Ag. CEO, Mr. Tobias Alando noted that promoting locally made products, in both local and international markets, is a sure way of achieving the Big 4 Agenda. “The manufacturing sector is key to Kenya’s economic growth due to its potential to grow productive jobs and increase the purchasing power of consumers. While Kenya is the most industrially developed country in the East Africa region, manufacturing only accounts for 8.37% of GDP. Increased competition from imported goods and services has been a challenge to Kenyan produced goods and services. This Mark of Identity hence seeks to promote Kenyan products locally and internationally, which is key in increasing exports, creating jobs and driving industrialization,” added Mr. Alando. Brand Kenya Ag. CEO, Ms Damaris Ngugi noted that the partnership deal will see both organizations synergize efforts to authenticate and promote locally made products in local and global markets. “The Made in Kenya Brand Mark was developed to boost the manufacturing industry by authenticating all Kenyan goods and services for the local and international markets. It will be placed on all Kenyan products and comes with a promise of authentic, organic and high quality products,” added Ms. Ngugi. 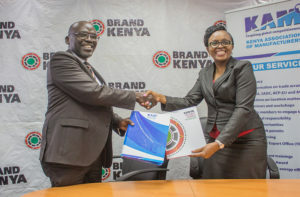 The Brand Kenya Board has also launched a continuous marketing campaign on its digital platforms for all companies and brands that will take up the Mark. A micro-site www.brandkenya.go.ke/madeinkenya has been developed and will enlist and promote all companies and brands that adopt the mark.